As anyone who has ever watched a 500-mile NASCAR race knows, the fastest car often does not win the race. Mechanical problems, flat tires, bad timing of caution flags and other unforeseen issues can derail the strongest efforts and send a surprise winner to Victory Lane. In the 1968 Daytona 500, the Wood Brothers No. 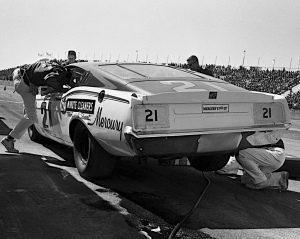 21 Mercury Cyclone, with Cale Yarborough driving, was clearly the fastest car, but it took several comebacks for the team to reach Victory Lane. Yarborough won the pole with a sizzling lap at 189.222 miles per hour, but the race was just 14 laps old when he limped into the pits with a skipping engine. It was the first season that NASCAR teams, including the Woods, used a pair of electronic ignition systems, and as bad luck would have it, Yarborough’s primary system had failed. In later years, drivers could change to the back-up system with the flip of a switch, but in ’68 that wasn’t the case. When Yarborough came to a stop, Leonard Wood climbed into the car to make the switch. Among the things he remembers from that day was a brief conversation with Yarborough inside the car. “Cale said: “Man, you got to fix it. This thing will fly,’” Wood recalled. He did fix it, and the car would fly. Yarborough charged back into the lead lap and in contention again only to suffer another setback in the form of a flat tire, which forced an unscheduled green-flag pit stop and another lap lost. But thanks to a fast car, a fast pit crew and an unusually high number of caution flags for that era – 11 of them which consumed 150 miles – he was able to again n rejoin the lead lap. But his worries weren’t over, as Wood recalled. Afterward, Wood got a first-hand look at how obscured Yarborough’s vision was. “I got in that car, and you couldn’t see a thing,” he said. When the circuit returned to Daytona that July for the Firecracker 400, the fastest car won without a hitch. The Woods did even better and had a total of seven wins that season as Dan Gurney drove their No. 121 Ford to victory on the road course at Riverside, Calif.